Your Living Room: The name says it all. More than being the literal, or figurative, center of your home, the living room must feel like one; drawing you in, welcoming you, encouraging your guests to stay a little longer. 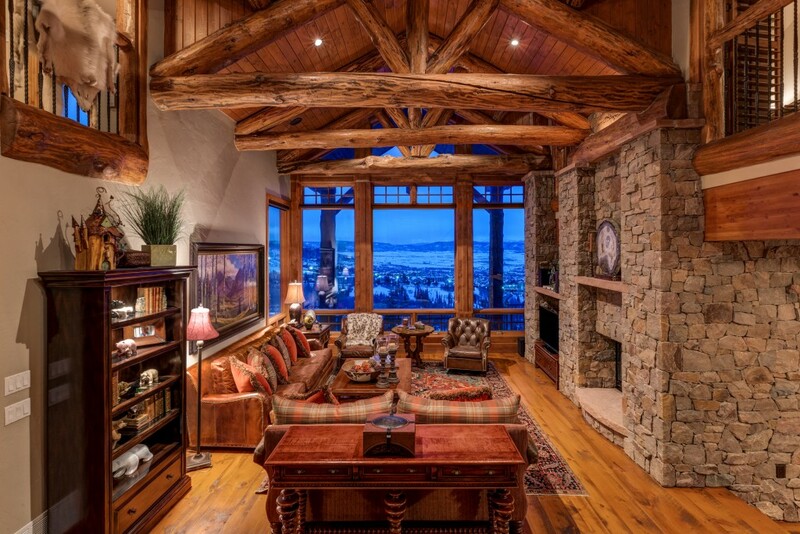 And when looking for Steamboat Springs real estate, your future living room should speak to you. With real estate in Steamboat Springs, CO, homes are sited to maximize the spectacular 360° views, and living rooms are integral to that. They can exquisitely frame the outdoors, even invite the outdoors in. And whether a living room is comfortable and cozy or grand and elegant, a living room should always be one thing: a reflection of you. First, and foremost, how does the space feel? Is it open and welcoming? Or is it more separate from the rest of the house? Consider how you plan to use the space, is it for more formal entertaining? Or is it a place to gather at the end of a day on the mountain? Both? Next, how is it laid out? Some buyers prefer a very open concept in which the living room is connected to the kitchen. Others searching for homes in Steamboat Springs want a living room that’s separate from the kitchen for a quieter space with less traffic. “Flow” is a word used a lot in real estate searches, and there’s a reason for that. As you walk between rooms, feel how they connect to each other, and make sure how the living room connects to other rooms works for you. As you walk through potential homes, also be aware of what is easily changed and what isn’t. When you first walk in to what might be your new living room, the color palette may not suit your taste. Look past the color to the actual features of the room. Repainting is easy, moving a window or fireplace is not. Speaking of fireplaces, most, if not all, Steamboat Springs real estate for sale will feature at least one fireplace. So, look at how the fireplace is situated within the living room. It may be a focal point of the room, or it could be more functional. Do you have a preference? Lighting is also a factor to consider. Is there a lot of natural light? A lot of windows? Does the living room feature built-in lighting? Are you facing north, south, east, or west? The direction your living room faces will affect both light and temperature. If the living room is oriented to the south and/or west, you will enjoy passive solar which will keep your living room warm and toasty. Heat is always a hot topic with Steamboat real estate. The winters are gorgeous and snowy, which has increased the popularity of heated floors. It’s a wonderful feature, but can be complicated to install. So, if radiant heat floors are important to you, make sure you ask your realtor about them. Have you considered having a wet bar in your living room? It could be a fantastic addition to a living room, especially if the home does not have what is considered an open floor plan. A wet bar can cut down on trips to the kitchen and makes entertaining a breeze. If the home your considering doesn’t have a wet bar, installing one could make your living room that much more enjoyable. And what about technology? Today’s living rooms are wired for everything from surround sound to wall-mounted smart televisions and wi-fi. It’s important to make sure your new living room is wired the way you want it to be. Finally, what floor is the living room on? It may seem an odd question, but homes for sale in Steamboat Springs, Colorado don’t always have the living room on the main floor, where they are traditionally found. To really make the most of the Yampa Valley’s spectacular views, the living room may be upstairs or downstairs. These non-traditional layouts can add an intriguing layer to the aesthetic of your house. You just have to find what’s right for you, your family and guests. Whether you are looking at ranches for sale in Steamboat Springs, a mountain retreat or a valley property on the river or by a lake, it’s the living room that sets the tone for the house. And, while everything we’ve mentioned is important, it’s also important to go with how you feel. Steamboat Springs real estate has something for everyone, and it starts with the perfect living room.